I’m available to speak about self care, getting unstuck, and channeling your Inner Wild Woman as paths to creating a heart centered business and life. In addition to sharing my introspective, creative process the audience will learn practical tips with a dose of inspiration! artists and art based organizations interested in exploring the healing power of art. 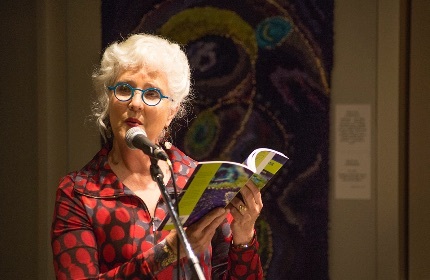 Join author, fibre artist, and former homeopath Meryl Cook as she shares how a health wake up call provoked an awakening for change, how writing sparked her creativity, led to deep healing and to finding her authentic self. Now she helps others use creativity to transform their lives One Loop at a Time. By discovering your own passions, understand where you are today and where you can go tomorrow. learn tips for harnessing creativity as a tool for wellness and self care. Your next step in life – what does it look like? How can you hold space for yourself to allow creativity and wellness to emerge? Join author and fibre artist Meryl Cook as she shares the simple, profound methods she has found helpful for unblocking creativity, moving forward through transitions and looking inside for answers. Experience a practical tool to tap into your own ability to unlock creativity. What does it mean to be a Wild Woman and how can you get there? Join author and fibre artist Meryl Cook for a playful look at how to reconnect with the person you really are, the person you were before life and responsibilities got in the way. Meryl will share the inspiration behind her Wild Woman series of hand-hooked mats and their connection to the Chakra colours, and help you get started on your Wild Woman journey! Learn how to begin incorporating Chakra colours into your creative life. Now booking speaking engagements for 2019! If you or your association are looking for a speaker at a conference, seminar, workshop, telesummit, radio show or podcast please contact me at meryl@merylcook.ca. *See also Press for an updated list of media interviews and articles. In addition to regular artist/author book promotion talks I have spoken at the following venues in 2018.
International Association for Journal Writing Telechat – One Loop at a Time: an exploration of the healing power of journaling, rug hooking and creative self expression, March 29. 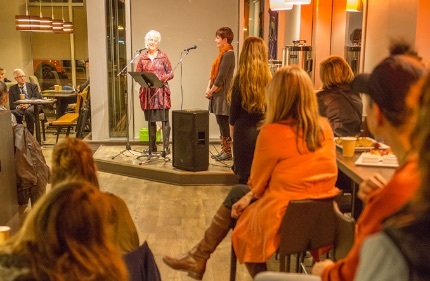 To launch my first book One Loop at a Time, a story of rug hooking, healing and creativity in 2017 I spoke to approximately 25 groups from St. John’s Newfoundland to Vancouver Island. Audiences included rug hooking groups, at book stores, art galleries and at women’s business conferences. Company of Women’s Stand Up, Speak Out, Soar conference in May 2017 Tapping into your Creativity to Raise Your Voice. 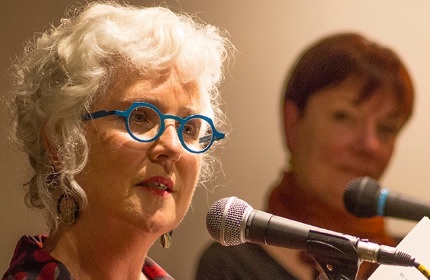 Eleanor Beaton’s Million Dollar Message Panel Discussion in November 2017.